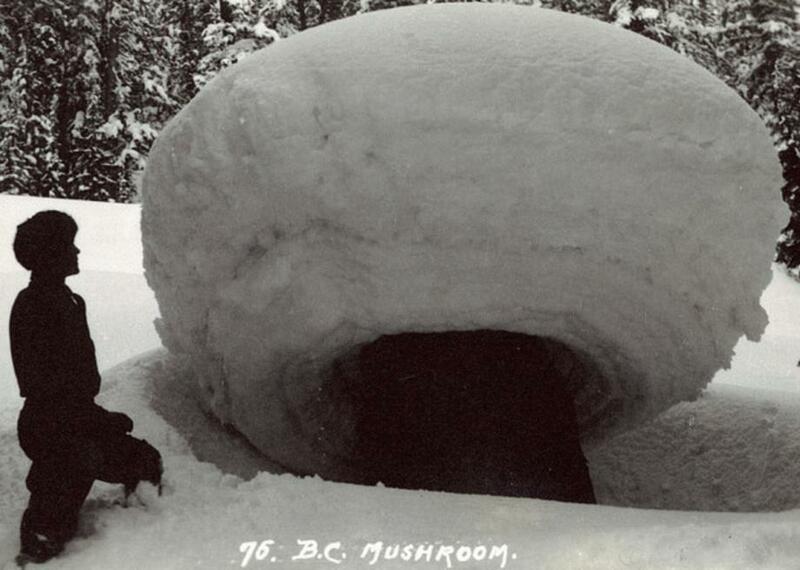 These giant snow mushrooms can grow to 12 feet wide. Guide Fred Pepper standing by a snow mushroom along the line of Canadian Pacific Railway. Vaughan Cornish had come to Canada’s Glacier National Park to look at waves. As a geographer, waves were his great passion. He was fascinated by undulating forms in seas and in deserts, in the movement of the clouds and in the movement of the land during an earthquake. In Canada, he wanted to observe waves of snow. In December 1900 he and his wife Ellen, an engineer and artist, left Britain and began their three-month journey to cross wintry North America on the Canadian Pacific Railway. In Montreal and Winnipeg and out the window of the train, they had observed fresh fallen snow and drifts and the waves Cornish was so drawn to. But when they reached Glacier National Park, they discovered a class of natural snow formations they’d never seen before. One of the snow mushrooms Cornish discovered. Snow mushroom formation begins with a tree, fallen or felled, that leaves behind a wide stump a few feet in height. In the winter, these stumps start accumulating snow. In Glacier National Park, the snow falls heavy and fast—as much as 12 inches an hour at some times, averaging 48 feet in total over the course of the winter—and the wind is calm. The result is that the snow gathers around the top of the stump. When I attempted to detach a small snow-mushroom from its pedestal, I found that it was very firmly fixed. Having driven a long pole into the mass of snow, which was about 4 feet across, I found it to be tough and tenacious, and I was unable to dislodge it … Place my pole against the tree, I gave successive pushes until the tree rocked violently, when at last the snow-cap fell, but as a whole, and it was not broken with its impact with the soft snow beneath. The effect of the snow mushrooms could be haunting. In some places, there were fields of mushrooms that would spring up above the snow. 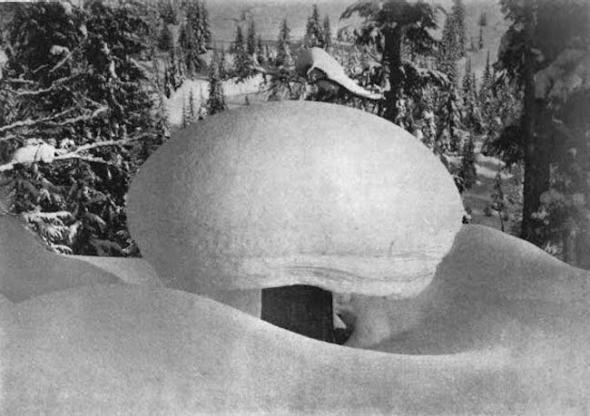 If the mushroom “stems” were short enough that the accumulation of snow eventually reached the mushroom bottoms, the balls created an undulating field of mysterious bumps. Glacier was the only place that Cornish found these features in his trek across Canada. But after he wrote in a popular publication about the discovery, he heard about a few other places in the country where these rare formations could be found. The conditions had to be exactly right: stumps big enough and tall enough, snowfall heavy and wet enough, and wind calm enough for the mushroom caps to form. More than 100 years later, it’s still possible to find snow mushrooms in Glacier National Park, although it seems they are rarer than they once were. On occasion, they pop up elsewhere in the world—here are a few in Japan—and they’re not always large. In this century, though, when there are fewer stumps wide enough to make snow mushrooms, these formations are a rare natural wonder.